All bouts have to start with two fighters standing at a distance, and when they do there’s always a chance that someone is going to get dropped. Once a fighter scores a knockdown in a fight, their chances of winning rise dramatically, and often it sets up an early finish. That means that identifying knockout potential on a card can mean big points for your fantasy team. So where does that potential lie among the UFC 200 competitors? Here is how this weekend’s fighters stack up in their historical performance of scoring and receiving knockdowns in the cage. Thiago Santos is stepping in on short notice to face veteran striker Gegard Mousasi. Mousasi is considered the clear favorite, but this fight has the potential to be a striking duel, and Santos’s power shows that he is capable of a big upset. Mousasi’s defensive avoidance is elite, so Santos needs to close the distance and get a chance to use that power. But if he does, fantasy squads giving him a shot will get a lot of bang for their buck. Brock Lesnar comes in at second place, having scored two knockdowns on just nine landed power head strikes. He may not be the most active striker, but when he lands a punch people go to down. However, it’s unlikely he’ll want to engage in a striking war on the feet with Mark Hunt who also boasts above average power. Lesnar’s game plan will likely be to unleash his power on the ground. Another heavyweight clash has both fighters bringing heavy leather, meaning the judges will not likely be needed. Velasquez and Browne will lead off the main card and we could see fireworks early. 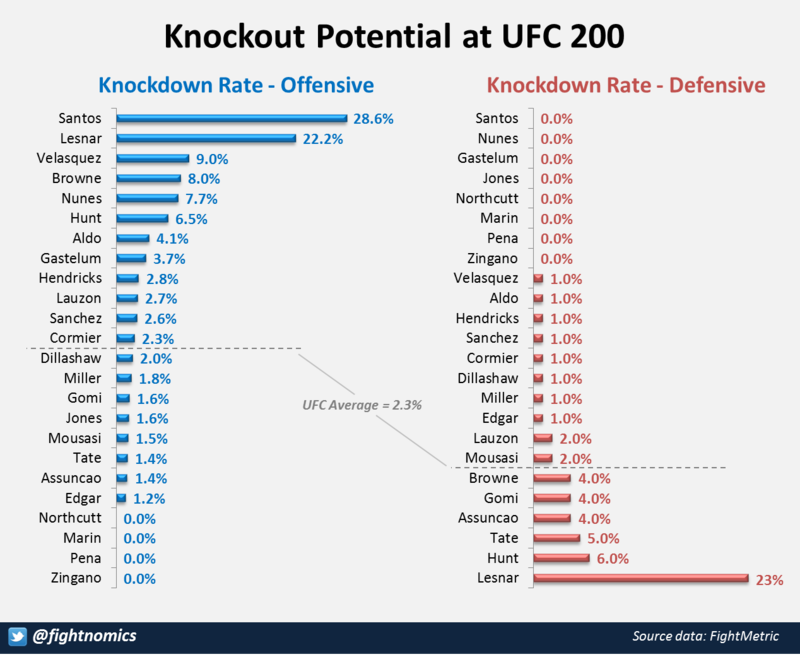 And it’s interesting that Amanda Nunes has demonstrated a very high knockdown rate, and is facing Miesha Tate who is at risk in her standup game. This could be another high reward upset play. Neither Zingano nor Pena has scored a distance knockdown to date, but both women have excelled on the ground and demonstrated power there. This matchup has title implications, but don’t expect either woman to succumb early or easily. Expect a battle, but probably not a highlight reel finish. As powerful as Brock Lesnar is, his standup game is still a big liability. He’s been dropped four times to date and should not underestimate Hunt’s power. While Hunt is also vulnerable, he’ll have the technical advantage and likely more durability while on foot. Rafael Assuncao will also need to be careful against TJ Dillashaw. The former champ Dillashaw’s sharp striking could test the chin of Assuncao if he’s caught coming forward. I am a promoter at DraftKings and am also an avid fan and user (my username is fightnomics) and may sometimes play on my personal account in the games that I offer advice on. Although I have expressed my personal view on the games and strategies above, they do not necessarily reflect the view(s) of DraftKings and I may also deploy different players and strategies than what I recommend above.